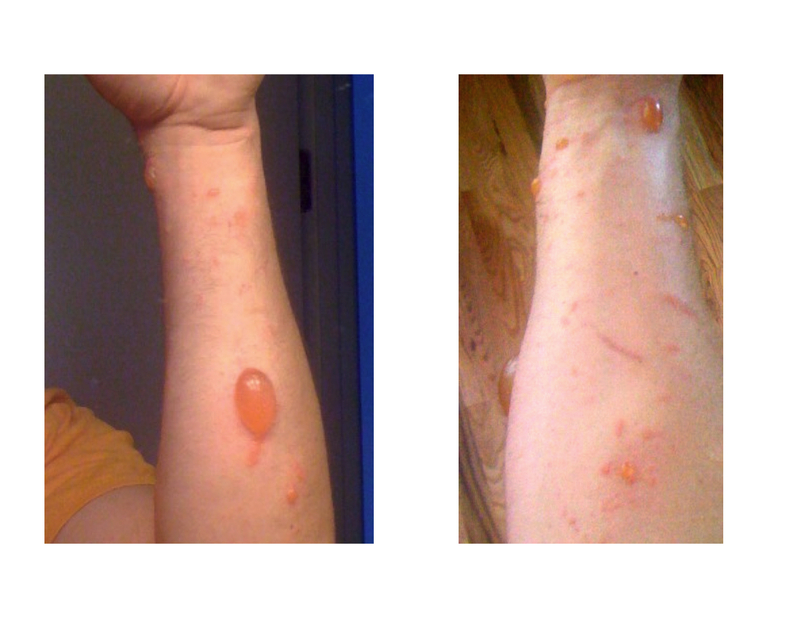 The glory of Autumn, courtesy of Poison Ivy. We all know its name, and know to avoid it, but very few of us actually know what it looks like. That’s a bit strange, isn’t it. Hopefully today’s post will help you avoid this evil plant from affecting you with its nasty sap. Click on all the images to see larger versions. 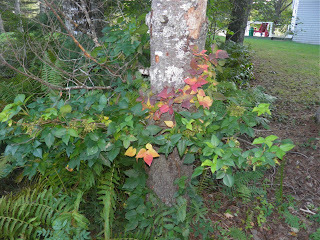 This plant is climbing a maple tree right alongside a road. Toxicodendron radicans is a deciduous poisonous plant that produces a compound called urushiol. This is found within the sap of the plant and causes an itching rash in most people who come in contact with it. Severe cases have fluid filled blisters. Poison “ivy” is not a true ivy, which is the family Hedera. It gets its name because it acts as an ivy and trails and climbs. But to confuse matters, it doesn’t necessarily have to be a vine. It also can be found as a shrub up to about 4 feet tall. Regardless of its form, the leaves are identical. Each glossy, pointed leaf appears in groups of three (trifoliate) which are gathered at the top of a stem which attaches to the main part of the vine. This “stem” can be woody and is how poison ivy climbs trees. It’s quite stunning in the Autumn, as the first picture on this post clearly illustrates. ground. That's my foot underneath it. Poison ivy grows in all of the Canadian provinces and American states east of the Rocky Mountains. Those west of the ridge are blessed with a slightly different variant, poison oak, which also grows in the southeastern USA. 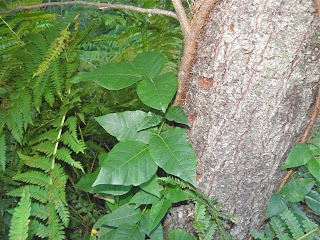 Poison ivy is very common on the northeastern seaboard of the US and Canadian Atlantic Provinces. 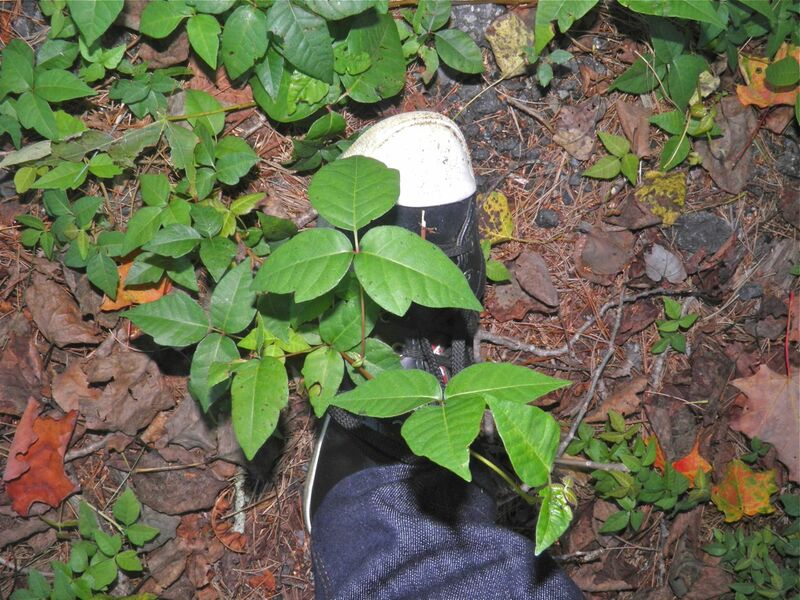 There are also areas in northern Mexico where poison ivy can be found. 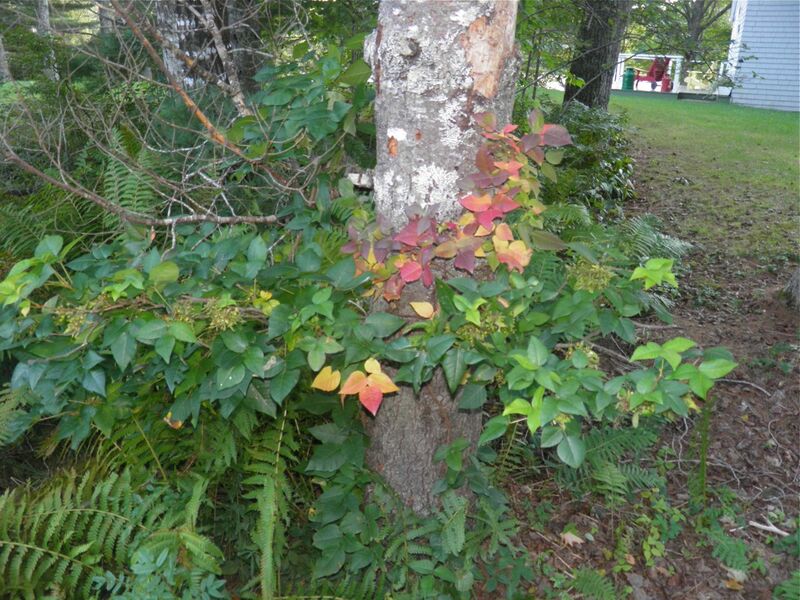 Poison ivy is not particularly fussy about the type of soil it needs to thrive. It will grow in both alkaline and acidic soils, as well as soils on the slightly damp side. It does not thrive in desert conditions. How does it make you itch? Urushiol is an oily organic allergen found in plants of the family Anacardiaceae, especially Toxicodendron spp. 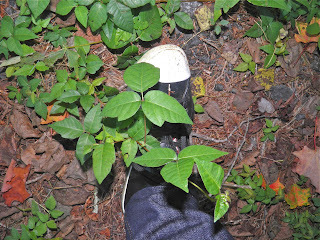 (e.g., poison oak, poison ivy, poison sumac). It causes an allergic skin rash on contact, known as urushiol-induced contact dermatitis. Symptoms of the rash include itching, inflammation, oozing, and in severe cases, a burning sensation. The American Academy of Dermatology estimates there are up to 50 million cases of urushiol-induced dermatitis annually in the United States alone, accounting for 10% of all lost-time injuries in the United States Forest Service. Poison oak is a significant problem in the rural western and southern United States, while poison ivy is most rampant in the eastern United States. 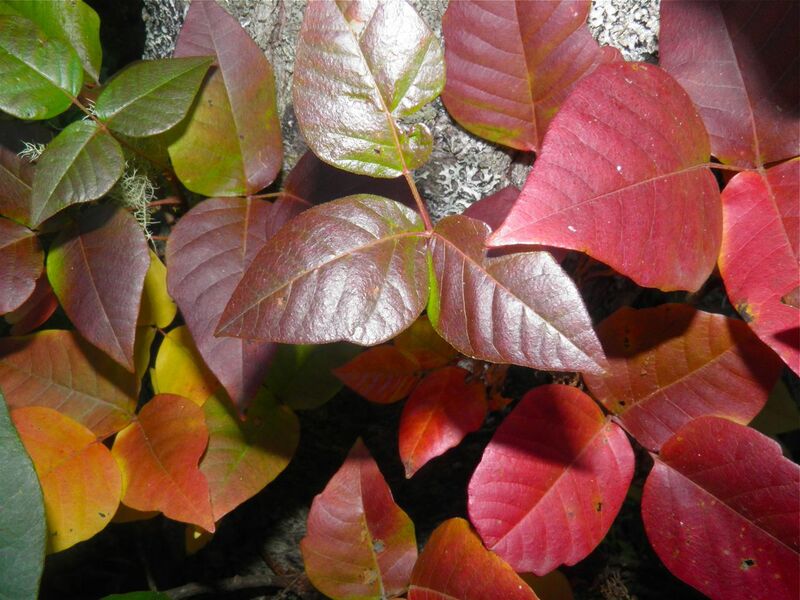 Dermatitis from poison sumac is less common, but also problematic. 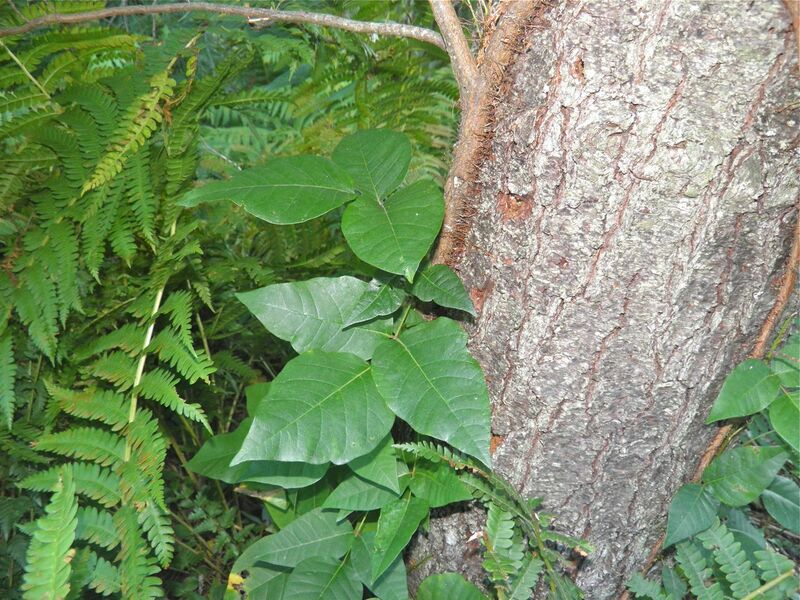 There are several ways you can attack poison ivy to rid your garden of this pest. They're all rather simple. 1. Pull the plants out by the roots. Make sure you use rubber gloves so the sap doesn't contact your skin. Throw the gloves out after you're done. You probably won't get all the roots so will have to repeat the process a few times as it re-emerges. 2. Use a herbicide to kill the plants. Of course this method will also affect any desirable plants that are in the same area. 3. Starve them of light. Cover the area with cardboard or any other light blocking material and leave it on the area for at least one season, if not two. Without the light necessary for photosynthesis any plant under the covering will die. 4. Dig the plants out by the roots. Once again, use rubber gloves and dig down at least 8-10 inches around the plants to dislodge them. Discard the entire plant and ball of dirt. My first introduction to this plant was when I was very young. I picked a bouquet and brought it home for my mother. She did exactly what was supposed to be done to alleviate my problem. The first thing you must do (within minutes if possible) is to thoroughly wash the affected area with soap and water. This will help get rid of any of the urushiol that is remaining on the skin. Do not use any abrasive products that may lessen the skin’s integrity and open areas for the chemical to enter. The second treatment stage is to treat the itching. Take antihistamine tablets (not external creams) or apply hydrocortisone cream externally to treat the itching sensation and blisters. Cold compresses can also alleviate the burning sensation temporarily. There are also over-the-counter products that can help dry out the blisters and speed healing. I believe my mother used Calamine Lotion on my affected hands and arms. Itching will NOT spread the rash, but may introduce bacterial infection. The main stalk of this plant is about as big around as my thumb. It is the round "attachment" running up the left side of the tree trunk. Note, if severe symptoms develop do not try to treat yourself at home but call your doctor immediately. I do not write this to frighten anyone. Usually symptoms are more annoying than worrisome. But there are some people that generally have stronger allergic reactions than most. Your doctor can prescribe medicine of greater strength to alleviate your symptoms. The blisters that may form need to be allowed to run their course, which can be in excess of a week. 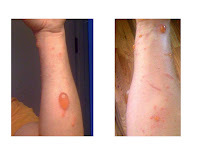 A person affected by poison ivy exposure cannot infect another person. The blisters are the result of allergic reaction, not disease. Just remember, the rash will pass if you leave it alone. Treat the effects of the exposure to lessen your symptoms and to make it more bearable. Also make sure you teach all your family members what this plant looks like, so one of your children doesn't arrive on your doorstep with a bouquet for you!